Demons have burned to the ground the temple Yumeko was raised in, killing everyone within, including the master who trained her to both use and hide her kitsune shapeshifting powers. Yumeko escapes with the temple’s greatest treasure — one part of the ancient scroll. Fate thrusts her into the path of a mysterious samurai, Kage Tatsumi of the Shadow Clan. Yumeko knows he seeks what she has...and is under orders to kill anything and anyone who stands between him and the scroll. 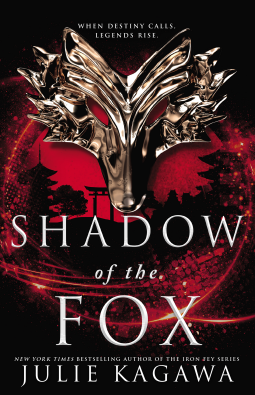 Shadow of the Fox is a book that kept me spellbound from start to finish. I loved the premise, the characters, and the seamless blend of Japanese folklore and myth with a fantasy world. There is a strong pop-culture influence too; I could see this story working perfectly as an anime or manga. I could picture the characters drawn that way. Another thing I appreciated about this book was the super-slow-burn romance. It's there, but it came about subtly, with no instalove or the standard YA love triangle. This is definitely a series I would like to continue reading. I can't wait to find out what will happen next!